Welcome! We are thrilled to announce the launch of the Environmental Sustainability Education Initiative at the College of New Jersey School of Education. Earlier this semester, we held a fantastic meet & greet for all students interested in the minor! Over the past several decades, many efforts have been made to encourage and develop education for environmental sustainability through large national and international agencies. For example, through the National Environmental Education Act of 1990, the US Environmental Protection Agency has provided leadership and support in spending $100 million to increase the public’s awareness of environmental issues (Potter, 2010). Likewise, the United Nations Educational, Scientific and Cultural Organization (UNESCO) put forth recommendations for education for a sustainable environment in 1996 (Fien & Tilbury, 1996). The North American Association for Environmental Education ([NAAEE], Hollweg et al, 2011) also offers recommendations for incorporating environmental education across the K-12 spectrum. Researchers largely agree that education is a critical part of any program targeted at moving toward a more environmental sustainable future (e.g. Mosley et al, 2010). Yet, environmental sustainability education is sparse and sometimes missing in undergraduate education programs designed to prepare teachers. 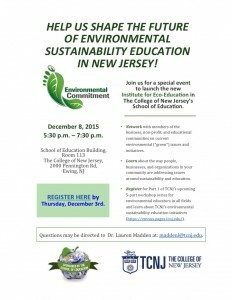 New Jersey has had a particularly strong focus on addressing sustainability education across the K-12 spectrum. For decades, Sustainable Jersey has worked with municipalities in the development and certification of sustainable practice, and more than 80% of the state’s municipalities have participated in these programs. Sustainable Jersey for Schools will has launched a voluntary program to allow schools to achieve Sustainable Jersey Certification. To become certified, schools will be required to complete and submit a balanced package of sustainability actions including those inside and outside the classroom. Thus, in our state especially, there is a need to develop future teachers well versed in Sustainability Education to lead their schools in this area. 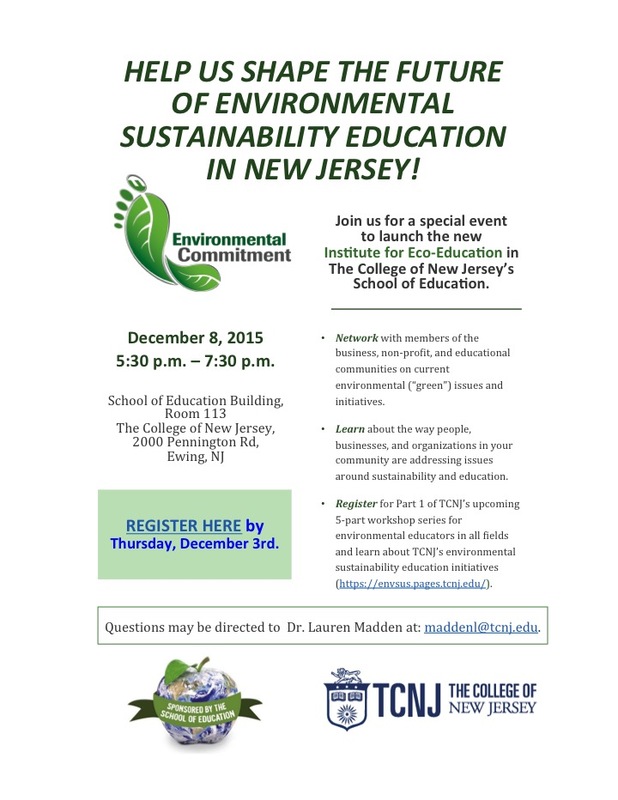 Hence, we launched our Environmental Sustainability Education Initiatives here at TCNJ. Our program includes three courses covering multiple perspectives on environmental sustainability education, a 5-course minor in Environmental Sustainability Education, and the development of a series of workshops for practicing teachers. For more information contact Dr. Lauren Madden at maddenL@tcnj.edu or 609-771-3316.